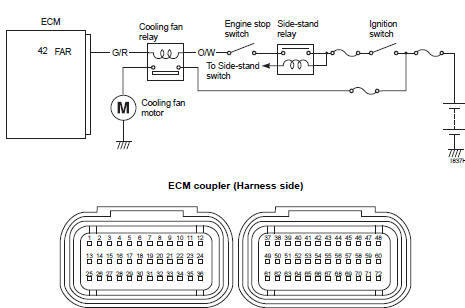 Cooling fan relay signal is not input to ecm. Cooling fan relay circuit open or short. Remove the frame covers. Refer to “exterior parts removal and installation” in section 9d . Check the cooling fan relay (1) coupler for loose or poor contacts. If ok, then inspection the cooling fan relay. Refer to “cooling fan inspection” in section 1f . Is the cooling fan relay ok? O/w and g/r wire open or shorted to ground, or poor “42” connection. Replace the cooling fan relay with a new one. Start the engine and run it in idling condition. Click “cooling fan relay control” (1). At this time, if an operation sound is heard from the cooling fan relay and cooling fan motors are operated, the function is normal. the cooling fan relay and cooling fan motor inspection is operational at any engine coolant temperature until reaching 100 °c (212 °f). In a hot engine condition with the intake air temperature exceeding 40 °c (104 °f), however, the engine coolant temperature at which the inspection is operational will be restricted to 95 °c (203 °f). Click the “stop” (3) to check the operation properly. Click the “off” (4) to check the cooling fan relay and cooling fan motor operation. this inspection should be begun from when the engine coolant temperature is below 50 °c (122 °f). Check that the cooling fan relay operates for a few seconds as the engine coolant temperature reaches each temp. Of 50 °c (122 °f), 70 °c (158 °f), 90 °c (194 °f) and 110 °c (230 °f)/above 4 000 r/ min. It is cooling fan motor malfunction or its circuit failure when the motor would not run even if the relay turns on. There is a tolerance of operating temperature of cooling fan relay.